Java 8 has introduced (among others) an ability to get a method parameter name at runtime. For backward compatibility (mostly with existing bytecode manipulation tools) it is required to enable it explicitly. The operation is as simple as an addition of a -parameters flag to a javac call in hello world tutorials. However, it turns out to be more enigmatic to configure in a Gradle project (especially for Gradle newcomers). For me as a Gradle veteran and Gradle plugins author construction withType and passing different compilation or runtime JVM options is a bread and butter. However, I needed to explain it more than once to less Groovy experienced workmates, so for further reference (aka “Have you read my blog? ;-) ) I have written it down. As a justification for them I have to agree that as a time of writing this blog post the top Google results point to Gradle forum threads containing also “not so good” advises. Hopefully my article will be positioned higher :-). Tested with Gradle 2.14 and OpenJDK 1.8.0_92. How parallel execution of blocking “side-effect only” (aka void) tasks became easier with Completable abstraction introduced in RxJava 1.1.1. As you may have noticed reading my blog I primarily specialize in Software Craftsmanship and automatic code testing. However, in addition I am an enthusiast of Continuous Delivery and broadly defined concurrency. The last point ranges from pure threads and semaphores in C to more high level solutions such as ReactiveX and the actor model. This time an use case for a very convenient (in specific cases) feature introduced in the brand new RxJava 1.1.1 – rx.Completable. Similarly to many my blog entries this one is also a reflection of the actual event I encountered working on real tasks and use cases. Imagine a system with quite complex processing of asynchronous events coming from different sources. Filtering, merging, transforming, grouping, enriching and more. RxJava suits here very well, especially if we want to be reactive. Let’s assume we have already implemented it (looks and works nicely) and there is only one more thing left. Before we start processing, it is required to tell 3 external systems that we are ready to receive messages. 3 synchronous calls to legacy systems (via RMI, JMX or SOAP). Each of them can last for a number of seconds and we need to wait for all of them before we start. Luckily, they are already implemented and we treat them as black boxes which may succeed (or fail with an exception). We just need to call them (preferably concurrently) and wait for finish. Unfortunately (in our case) Observable expects to have some element(s) returned. We need to use Void and awkward return null (instead of just method reference job::execute. Next, we can use subscribeOn() method to use another thread to execute our job (and not block the main/current thread – we don’t want to execute our jobs sequentially). Schedulers.io() provides a scheduler with a set of threads intended for IO-bound work. Finally we need to wait for all of them to finish (all Obvervables to complete). To do that a zip function can be adapted. It combines items emitted by zipped Obserbables by their sequence number. In our case we are interested only in the first pseudo-item from each job Observable (we emit only null to satisfy API) and wait for them in a blocking way. A zip function in a zip operator needs to return something, thence we need to repeat a workaround with null. It is pretty visible that Observable was designed to work with streams of values and there is some additional work required to adjust it to side-effect only (returning nothing) operations. The situation is getting even worse when we would need to combine (e.g. merge) our side-effect only operation with other returning some value(s) – an uglier cast is required. See the real use case from the RxNetty API. There could be another approach used. Instead of generating an artificial item, an empty Observable with our task can be executed as an onComplete action. This forces us to switch from zip operation to merge. As a result we need to provide an onNext action (which is never executed for empty Observable) which confirms us in conviction the we try to hack the system. Better support for Observable that doesn’t return any value has been addressed in RxJava 1.1.1. Completable can be considered as a stripped version of Observable which can either finish successfully (onCompleted event is emitted) or fail (onError). The easiest way to create an Completable instance is using of a fromAction method which takes an Action0 which doesn’t return any value (like Runnable). Next, we can use merge() method which returns a Completable instance that subscribes to all downstream Completables at once and completes when all of them complete (or one of them fails). As we used subscribeOn method with an external scheduler all jobs are executed in parallel (in different threads). await() method blocks until all jobs finish (in a case of error an exception will be rethrown). Pure and simple. Some of you could ask: Why not to just use CompletableFuture? It would be a good question. Whereas pure Future introduced in Java 5 it could require additional work on our side, ListenableFuture (from Guava) and CompletableFuture (from Java 8) make it quite trivial. First, we need to run/schedule our jobs execution. Next, using CompletableFuture.allOf() method we can create a new CompletableFuture which is completed the moment all jobs complete (haven’t we seen that conception before?). get() method just blocks waiting for that. We need to do something with checked exceptions (very often we don’t want to pollute our API with them), but in general it looks sensible. However, it is worth to remember that CompletableFuture falls short when more complex chain processing is required. In addition having RxJava already used in our project it is often useful to use the same (or similar) API instead of introducing something completely new. Thanks to rx.Completable an execution of side-effect only (returning nothing) tasks with RxJava is much more comfortable. In codebase already using RxJava it could be a preferred over CompletableFuture even for simple cases. However, Completable provides a lot of more advances operators and techniques and in addition can be easily mixed with Observable what makes it even more powerful. To read more about Completable you may want to see the release notes. For those who want to have a deeper insight into topic there is a very detailed introduction to Completable API on Advanced RxJava blog (part 1 and 2). The source code for code examples is available from GitHub. Btw, if you are interested in RxJava in general, I can with a clear conscience recommend you a book which is currently being written by Tomasz Nurkiewicz and Ben Christensen – Reactive Programming with RxJava. How to simplify Mockito usage by removing static imports in Java 8 based projects. Imports can be hidden in IDE and usually do not disturb much. Nevertheless to be able to write just a method name (e.g. mock(TacticalStation.class)) without a class is it required to press ALT-ENTER (in IntelliJ IDEA) to add each static import on the first usage of a given method in a test class. 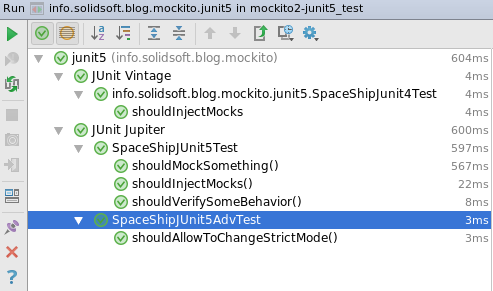 The situation is even worse in Eclipse where it is required to earlier add BDDMockito to “Favorites” in “Content Assist” to make it suggested by IDE. Eclipse guys could say “you have to do it just once”, but as I experienced during my testing/TDD trainings it makes a Mockito learning (usage) curve a little bit steeper. Of course there are some tricks like using star imports by default for Mockito classes to reduce number of required key strokes, but if you use Java 8 in your project (hopefully a majority of you) there is a simpler way to cope with it. The code looks exactly like in the previous snippet, but there is not need to do any static import (besides a normal import of WithBDDMockito itself). Under the hood the WithBDDMockito interface implementation is dead simple. All methods are default methods which just delegate to proper static method in BDDMockito class. – WithBDDMockito – stubbing/mocking API in BDD style (provides also classic API). Java 8 has opened the new opportunities how (test) code can be written in more compact and readable way. Static imports free Mockito code can simplify writing tests a little bit, but there is more feature already available in Mockito-Java8 and even more to be included in Mockito 3.0 (those for which Mockito internals have to be modified in a non backward compatible way). Too take more ideas how code/projects can be refactored to benefit from Java 8 you can see my short presentation “Java 8 brings power to testing!” (slides and video). Mockito-Java8 2.0.0-beta (for Mockito >=2.0.22-beta) and 1.0.0-beta (for Mockito 1.10.x and earlier betas of Mockito 2) is available through Maven Central. The versions should be pretty stable, but I would like to get wider feedback about this new feature, so it is labeled as beta. More details can be found on the project webpage. Acknowledge. The idea was originally proposed by David Gageot (the guy behind Infinitest) in one of his blog posts.